I'm still a little torn on this one. It's hard to fault a handbag like this. Its coffee colored leather is a timeless choice, and the fringing hangs just so. But there's also nothing to really rave about here either. I feel like I've seen it all before, and that's problematic when you're competing for handbag dollars. What will convince us to pick up this fringed hobo over the many others on the market? Probably the price won't do it. With a retail value of $725, this is more expensive that many of those comparable bags. You'll definitely find pricier fringed hobos as well, but they're likely to be made by high class brand with dedicated followers. Furla isn't in that same league, so on cost alone the Halley's likely to be passed over. The carrying options could help to convince us though. The twisted strap is lovely, but probably not so practical once this rather large hobo is full. That's when the longer cross-body strap comes into its own. Both are detachable, so you can enjoy a clean look no matter which handle you're using. I also like all the space Furla offers, even if its pair of pockets don't really cut the mustard. There's a lot to like about the Halley, but without a lot to really separate it from its competitors I worry that it'll get lost in the crowd. 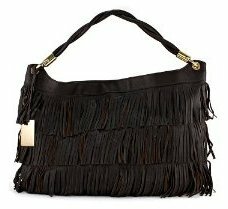 The Prezzo Fringe Hobo bag, a great alternative to this leather bag.